Today is the birthday of Teresa of Avila (1515-1582), a Spanish nun, theologian, mystic, writer of such spiritual classics as Interior Castle and Way of Perfection, one of only two female Doctors of the Church, and founder of the order of Discalced Carmelites. The term ‘discalced’ means without shoes and was chosen by Teresa to signify their poverty. She first joined a Carmelite convent at the Monastery of the Incarnation in Avila but was disappointed with their spiritual lassitude and worldly ways, so she established the reformed Discalced order. She went on to found seventeen houses of the order for women throughout Spain, often facing severe opposition. Teresa’s spirituality was a deeply contemplative type of mystical state resulting in union with God. Her mystical experiences connected her intensely and ecstatically with the divine love of God. She would often experience involuntary trance states and there were several reports of her levitating during Mass. At first her confessors feared she was under some demonic influence, but her eloquent accounts of her love for God convinced them that her visions and trances were authentic. It has long been recognized that Teresa’s descriptions are often written in the language of eroticism and reflect a type of spirituality sometimes called bridal mysticism, wherein the soul is wedded to God in spiritual passion. Mystics often use this type of language because it is an experience that ordinary words cannot adequately convey. This piercing of the soul by God is known by the theological term of transverberation. It is a sublime event beyond normal human understanding which can only be comprehended through the language of the intensely physical sensation of passion. In his sculpture Bernini has tried to translate this passion into marble to portray the depth of her spiritual experience. We see Teresa swooning in a fit of ecstasy, with her eyes closed and her lips parted as she sinks onto the cloud supporting her. The angel smiles sweetly as he prepares to plunge the arrow into her heart. It seems that a wind is blowing around both figures, and the angel’s garment wraps around him seductively while Teresa’s heavy robes billow and swirl in a way that heightens her dramatic earthly trance. Bernini’s skill allows us to see the different textures and weight of their garments and the feathery lightness of the angel’s wings. The backdrop for the sculpture is dozens of gilded rays topped with a hidden window that allows light to stream down, creating a heavenly setting for the vision. The whole is encased within an aedicula, or shrine, framed by colored marble pillars topped with Corinthian capitals and roofed with an ornate curving broken pediment that invites the viewer to enter into the scene. Among the many quotable writings of St. Teresa, here are two to reflect upon. One is like a prayer, the other reflects Teresa’s sensible advice. Let nothing make you afraid. If you have God you will want for nothing. 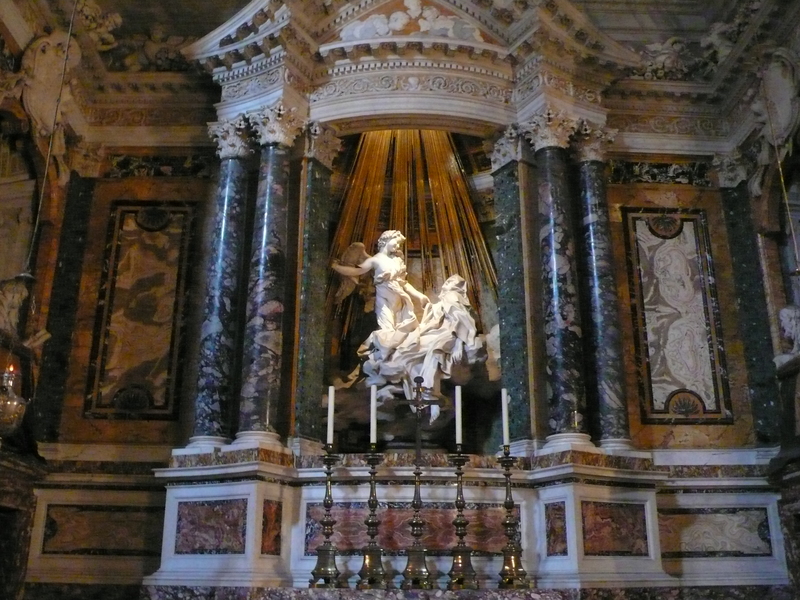 This entry was posted in Art, Faith and tagged art, art history, Bernini, Catholic, contemplation, Teresa of Avila. I will never forget the intense feelings I had first viewing this masterpiece in person…it is magnificent. And that prayer…”Let nothing disturb you”…I bought the prayer cards there with that prayer and I treasure them! God alone truly does suffice! Thanks Jane! Jane, I’m crazy about this: “stupendously theatrical confection”. Your phrasing blows me away! Another fantastic post. Bravo!